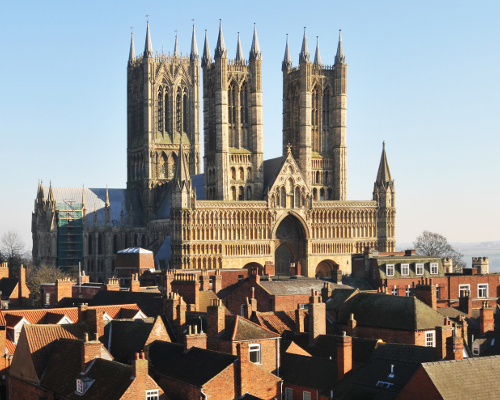 The vibrant cultural quarter of Lincoln is home to one of the greatest Cathedrals in Europe. Considered one of the hidden gems of Britain, Lincoln is a medieval city built on the site of a major Roman settlement. Visitors today can see the past, present and future combined in a magnificent setting. The Cathedral possess one of the four remaining original Magna Carta from 1215 which it displays in the Castle nearby, drawing people from across the world to see the ‘birth certificate of democracy’. This iconic building houses breathtaking architecture, a medieval library, the shrine of St.Hugh, the tomb of Katherine Swynford and many more hidden treasures. The Cathedral is open daily and tours can be booked on arrival.